While sitting at the hair salon with my friend Val, we decided that Mexican food sounded really good. Having seen a post on Juanita Burritos & Tacos on Hungry Girl’s blog, we figured we’d give it a shot. Disclaimer: Val grew up on homemade Mexican food (as in her dad handmade tortillas as a kid) and I’m from San Diego (basically Mexico); therefore, in terms of Mexican food, we’re hard to impress. With that said, we might be harsher than your average customer. 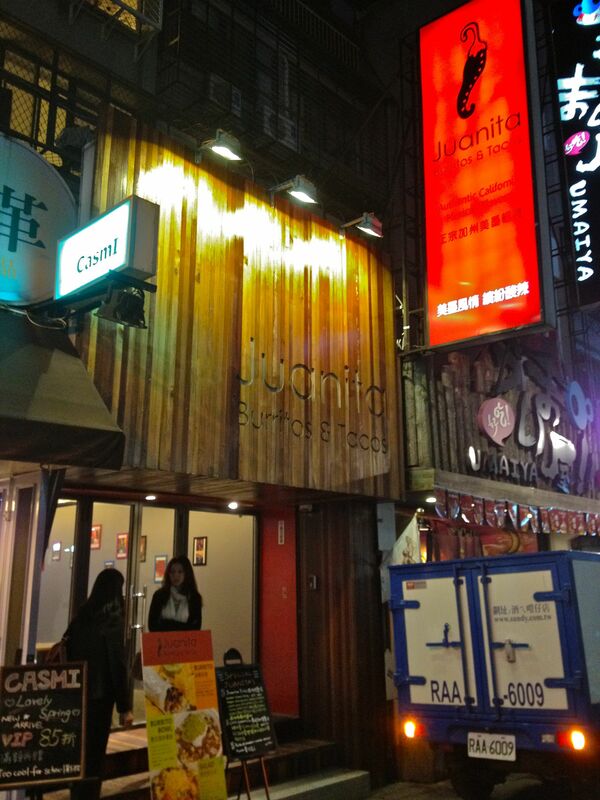 Juanita’s is located pretty much right in between MRT Zhongxiao Fuxing and MRT Zhongxiao Dunhua. If you get off at Fuxing, you’ll need to head NE out of Exit 4; if you get off at Dunhua, you’ll need to head NW out of Exit 8. In one of the many alleys filled with food, drinks, and clothes in the dongqu (東區) area, Juanita’s is located in Lane 160 off Dunhua S. Rd. (the alley where Sugar & Spice is located). Upon entering our first impression was, this place is Chipotle. I remember a while back a Mexican restaurant named Oola had opened in Gongguan (公館) that was Chipotle-style as well; however, it has since closed. 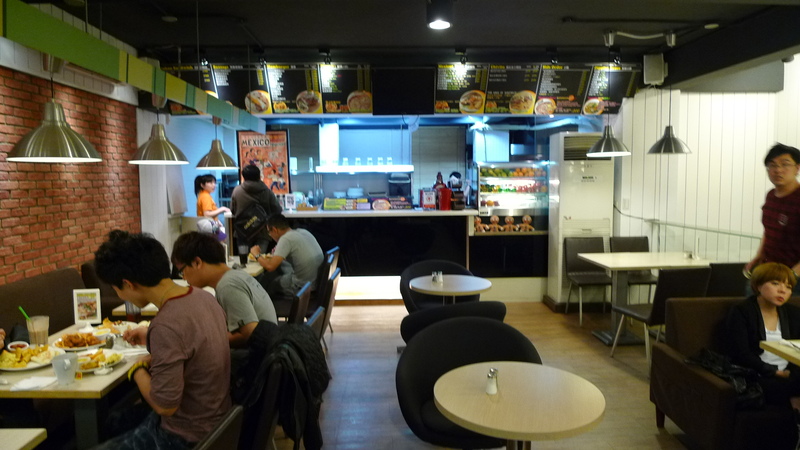 I never got to try Oola, but it seems like the Chipotle-style Mexican food thing is the way people are going in Taipei. Juanita is pretty new, opened less than a year ago, so everything is still pretty shiny and new looking. Note: the chairs, while they look cool, are terribly uncomfortable. Whoever thought metal chairs with giant holes in them would be comfortable to sit in needs to revisit their idea of comfort. The menu: just like Chipotle you start by choosing whether you want a burrito (波麗多捲), burrito bowl (墨式風味蓋飯), salad (墨西哥沙拉), or tacos (塔可; 1 for 70NT or 3 for 180NT). 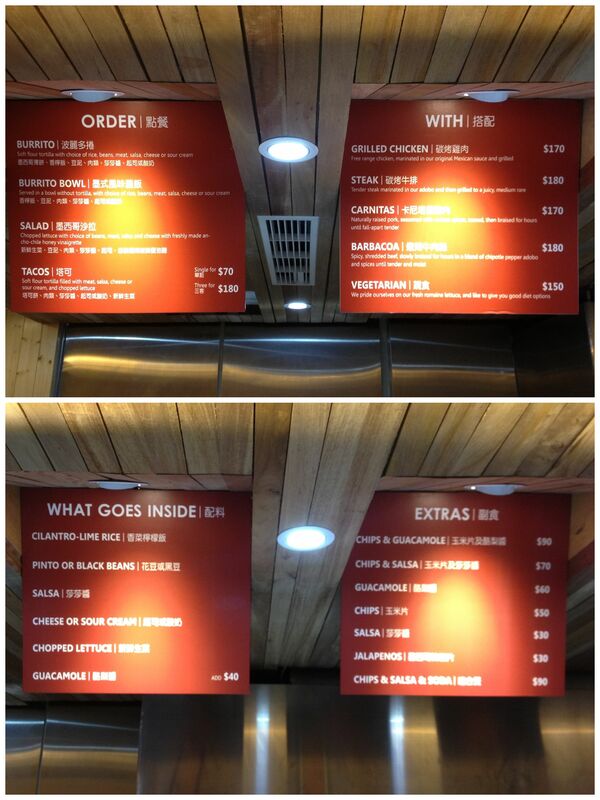 Then you choose your filler: grilled chicken (碳烤雞肉), steak (碳烤牛排), carnitas (卡尼塔燉豬肉), barbacoa (燉辣牛肉絲), or vegetarian (蔬食). Lastly, almost exactly like Chipotle you get the choices of cilantro-lime rice, pinto or black beans, salsa, cheese, sour cream, romaine lettuce, and guacamole (for 40NT extra). Val was up first. She opted for the grilled chicken burrito for 170NT. The grilled chicken was described as “free range chicken, marinated in our original Mexican sauce and grilled.” The burrito itself is a decent size-ish, but Val was saddened by the stinginess of the ingredients: the scoops were tiny and hardly any meat was put in. The grilled chicken itself was a bit dry, which was disappointing. Also, Val specifically asked the guy behind the counter if the black beans were hard, and he assured her they weren’t, but alas, they kind of were. Regardless, Val thought that the burrito was good enough to satisfy her craving. 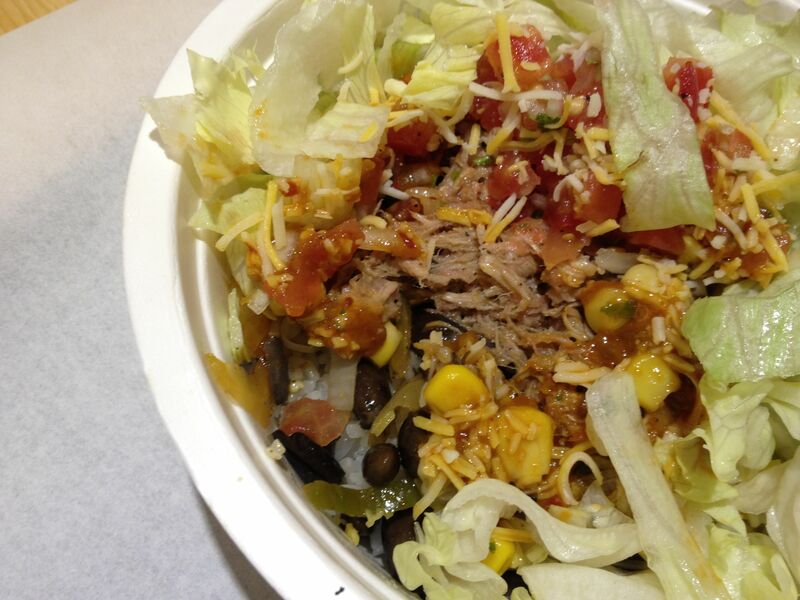 I decided on the carnitas burrito bowl for 170NT. The carnitas were described as “naturally raised pork, seasoned with various spices, seared, then braised for hours until fall-apart tender.” Like Val, I was disappointed by the amount of ingredients I got. The carnitas were quite disappointing as well…they were kind of tough, kind of dry, pretty stringy, not very flavorful, definitely not “fall-apart tender” as they claim. Basically they were all the things you don’t want your carnitas to be. 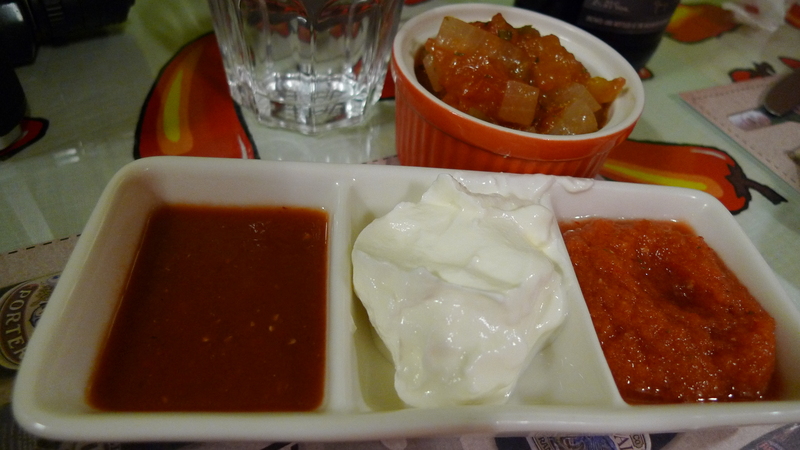 In terms of salsa, I opted for the spicy salsa, which was rather spicy, which I liked. I also added guacamole, which is supposed to be 40NT, but I was only charged 20NT? I don’t know, I’m not complaining, a little confused maybe, but a discount is a discount? I did quite enjoy their guacamole; it was pretty fresh tasting and rather delicious. All the other ingredients were pretty so-so, nothing was particularly great or terrible. Outside of the restaurant there was a chalk board with some specials on it. 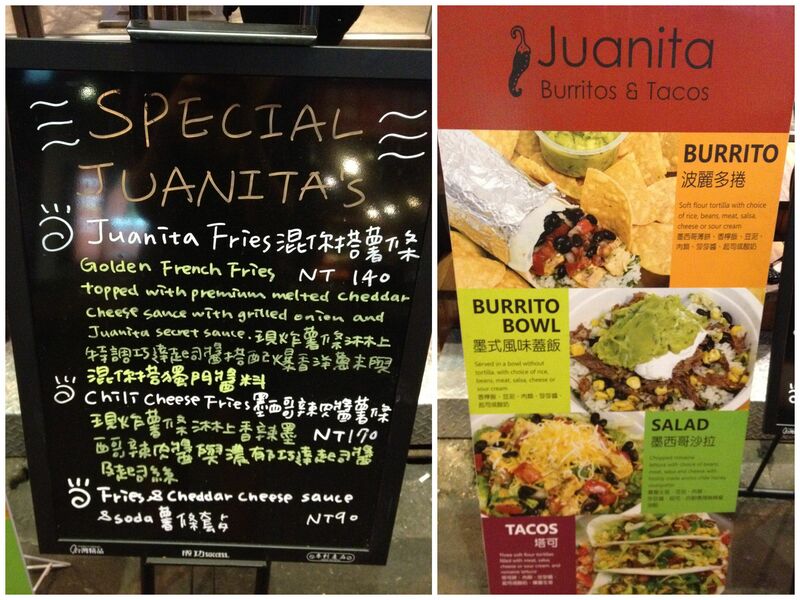 Among them was the Juanita fries for 140NT. We figured anything with the namesake should be ordered, so we got an order. 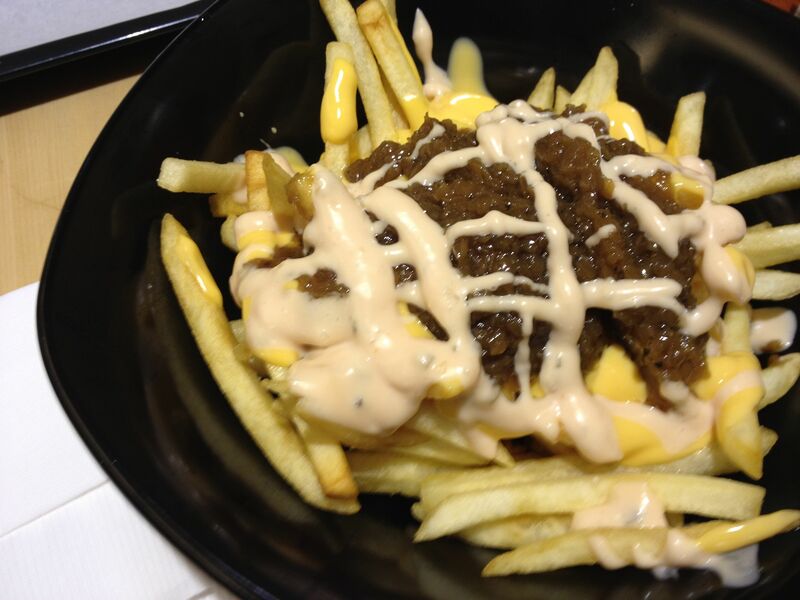 After thinking about it, they kind of reminded me of animal-style fries from In N Out, as they had some kind of grilled onion relish deal, “special sauce” and some “premium melted cheddar cheese”. Okay, let’s be real, people, the “premium melted cheddar cheese” tasted like regular ole’ nacho cheese sauce. Either way, the fries were tasty, would have made great drunk food. The overall consensus was that Juanita is okay. If you’re really craving Mexican food, it’s good enough to satisfy a craving, just don’t come with expectations of amazing authentic Mexican cuisine, not that Chipotle is either, but at least Chipotle isn’t stingy with their ingredients, nor is their meat dry. However, on the plus, Juanita is affordable and the food is decent enough. We’ve decided maybe we’ll go back to Juanita and try the other meats, give them a second shot. Until then, Juanita, you are a-okay, but that’s about it. If you’ve ever seen the giant gingerbread man statue wearing a sombrero and wondered what it as for, I can tell you it’s for GoodDay: California Style Mexican Food. I had seen the gingerbread man before, but never really knew what it was for. So, when a friend told me it was a for a place that sold tacos and burgers, I figured, why not give it a try. GoodDay has a few locations. 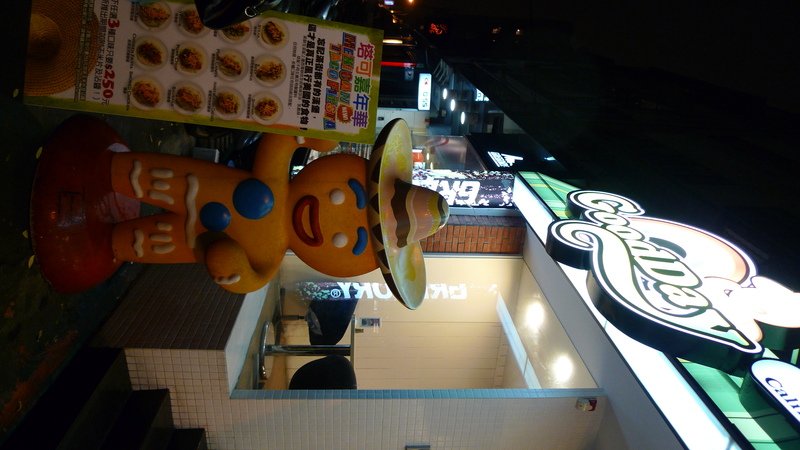 I remember seeing the gingerbread man at Ximen Ding (西門町) before. The Dunhua location has two floors. We sat on the basement floor; both floors have a decent amount of seating. I will preface this review with this: as a native Californian this is in no way real Mexican food. I’m not sure what they mean when they claim that they serve “California style Mexican food”, as the store boasts on its storefront, but Mexican food in California is leaps and bounds better. With that said, this place is not bad, it’s just not great. The menu is pretty eclectic; they have burgers, “Mexican food”, sausages, pizza, etc. Most items range from 180NT-300NT (per person). 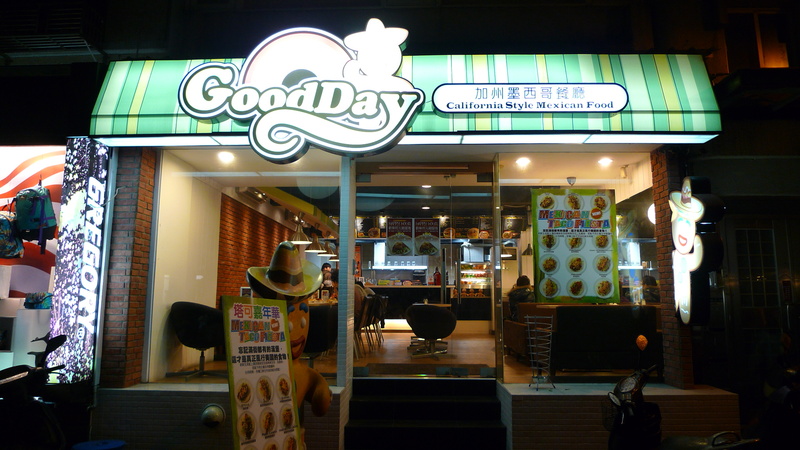 Most items have the option for ordering the standard portion (標準版) or the “Goodday” portion (原版), which is about 20NT-30NT more than the standard. We were told that the “Goodday” portion is about 25% larger than the standard (note that not all items have this option.). 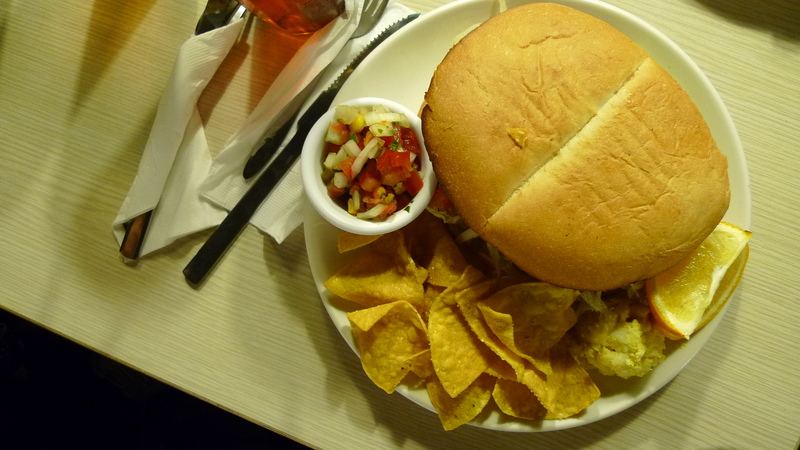 All meals come with tortilla chips, small scoop of macaroni salad, fruit, and your choice of one of four sauces: chedder cheese (切達乳酪醬), salsa (墨式莎莎醬), pico de gallo (經典辣莎莎), and honey mustard (蜂蜜芥末). The pico de gallo is pretty great: a mixture of tomatoes, onions, jalepeno peppers, and corn. One great thing I love about this place is that they have Cholula hot sauce! They also have Tapatio and some scary kelly green habanero sauce. Stephanie and I decided to split the carnitas torta (卡尼塔豬墨西哥漢堡) for 240NT and the standard portion chicken quesadilla (雞肉香烤墨西哥酥餅) for 180NT. The carnitas torta was okay. I don’t know that it’s really that torta like, but there was nothing really bad about it, it just wasn’t great. The torta comes in four flavors: pork chop, chicken drumstick, chicken, and carnitas. I personally found the carnitas to be a little dry and lacking in flavor. Inside the torta was the carnitas, shredded lettuce, onions and mayo. Steph was sad there was no cheese, as was I (we are both cheese lovers). We both found the overall sandwhich to be lackluster. 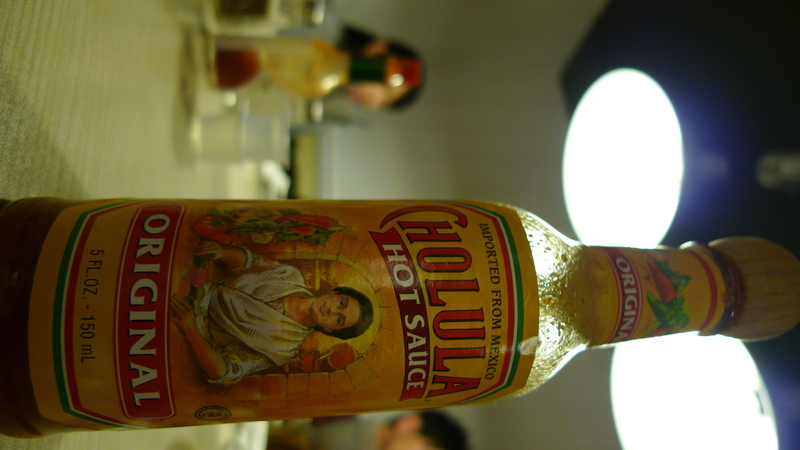 The addition of cholula added some needed flavor, but still only made it okay, not a standout. In comparison to the cuban sandwich that Steph had previously ordered from them, she said she preferred the cuban. 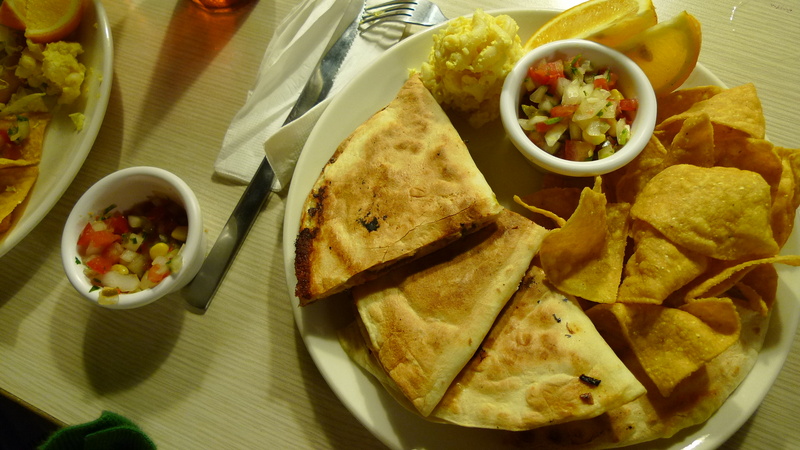 The quesadilla comes in three flavors: cheese, beans, and chicken. We decided on chicken. When we asked the girl at the counter about how much cheese would be in it if we chose chicken she said not much, but we figured it’d still be cheesy enough. I mean, it’s a freaking quesadilla. We inquired about adding extra cheese and she said it would be an extra 30NT. In hindsight we should have added the extra cheese. When the quesadilla came out, it was pretty dry. The chicken was pretty well seasoned, and not too dry; however, there was not much cheese in it at all. I did like that there was a hint of spice in the quesadilla. I’m not sure if it was because they used a pepper jack cheese or if they just had some jalepeno in it. Either way, I was a fan of the flavor. All it needed was some more cheese and this would have been much better. We went with a group so a lot of other things were ordered. They had a 3 for 250NT taco deal going on. 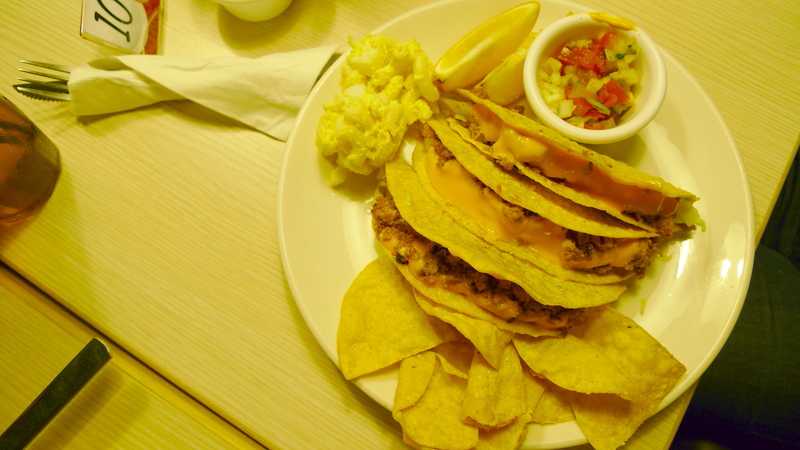 12 different flavors of soft tacos (塔可夾餅) to choose from: steak, beef, shrimp, fish, carnitas, honey mustard chicken, veggie, pork chop, sausage, chicken, chicken fajita, and smoked chicken. I think our table ended up with like 4 orders of various flavors. From the sounds of it everyone was happy enough and they looked pretty decent. 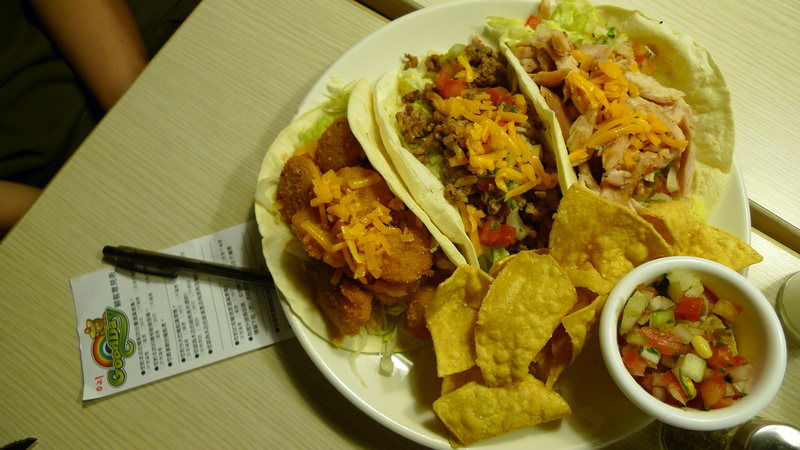 You can also get hard tacos (酥炸塔可), although I think our group preferred the soft. 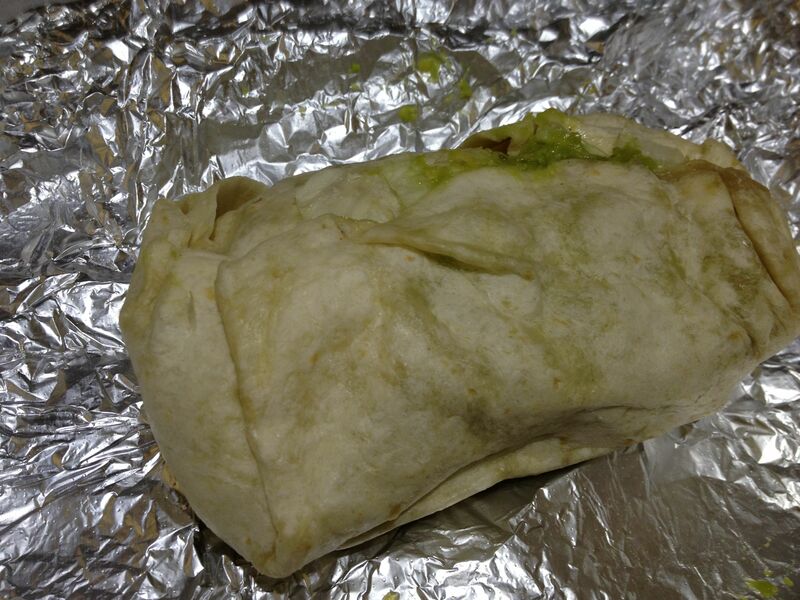 William decided to get a beef burrito (牛肉波利多捲) for 200NT. Overall this place isn’t bad. It’s just not great. Steph mentioned that the quesadilla was not as dry the last time she got it. In the end, I don’t know that I’d necessarily go back to GoodDay, but it’s not because it was bad, it’s just because there is so much other stuff to eat in Taipei. 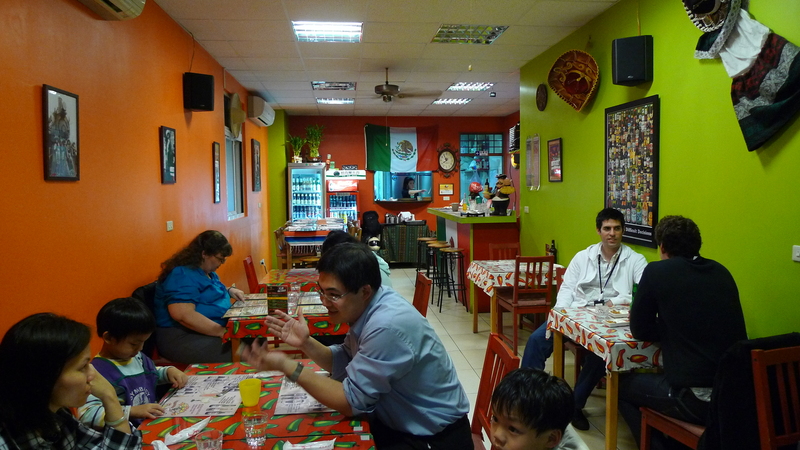 <300NT, 3 hearts, 300-600NT, danshui (淡水), dinner, mexican, updated. 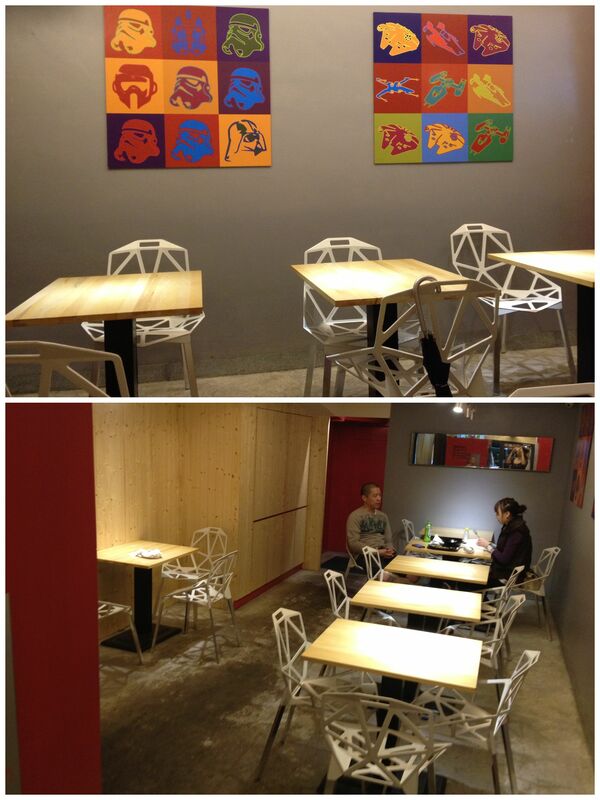 The Danshui location of Eddie’s Cantina is closed, but don’t fret, they have a second location in Tianmu! It’s been about a year since I was last at Eddy’s (here is my first review). My friend had never been, but heard a lot about it so she wanted to try. It looked like there was a few new items on their menu, but for the most part it was the same; prices were the same, too. Stephanie decided to get a Corona, which I think cost 110NT. 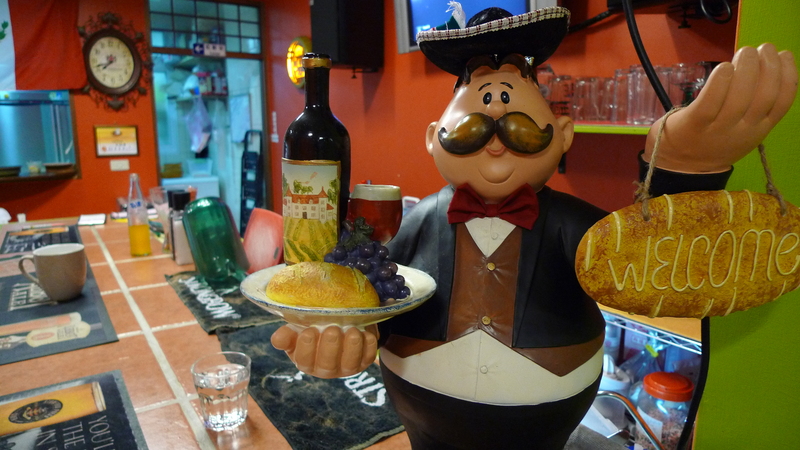 We decided to split the papas fritas a la mexicana or something like that for 210NT (?). 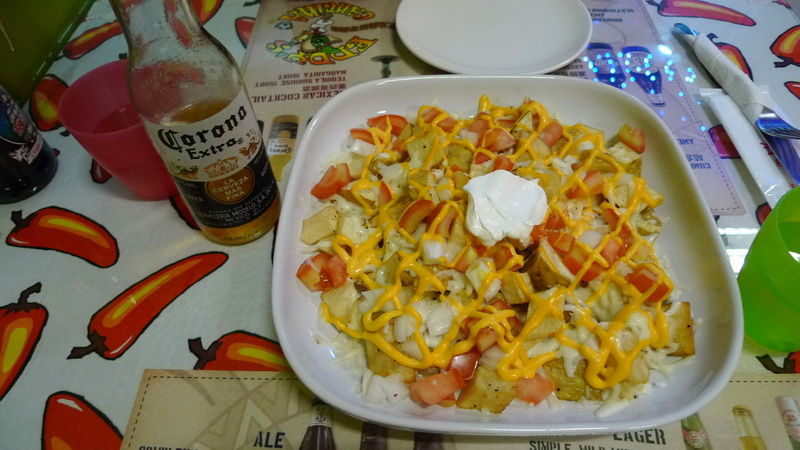 It’s pretty much Eddy’s nachos, but with potatoes instead. Only difference is, the papas fritas does NOT come with meat; however you can add meat for like 60NT or something. The papas fritas come with potatoes (obviously), tomatoes, onions, melted (I’m guessing) jack cheese, nacho cheese, and sour cream. Overall, this was not bad. Biggest complaint would be that it was a little dry and not hot enough; I could also have used more cheese. I remembered from the first time that they provide you with some salsa, but they didn’t give us the salsa until our main course came. It would have been really useful for this. Also, because it wasn’t hot enough, the cheese wasn’t as melty as it should have been. I would however get this again, probably, because I love potatoes. 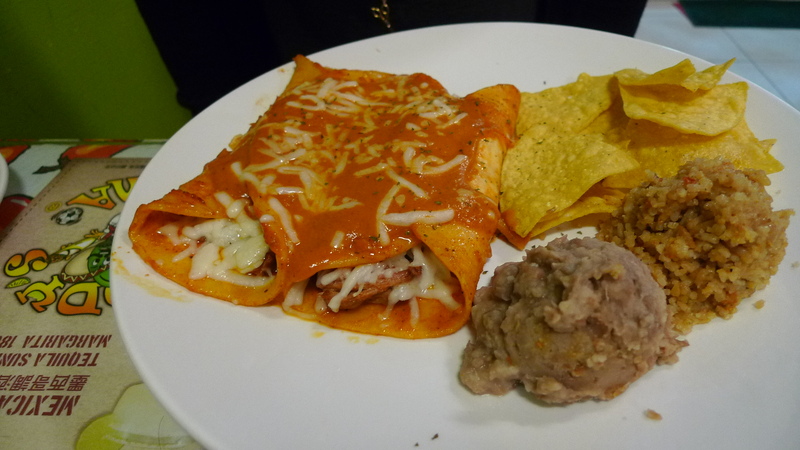 Stephanie decided to go with the carnitas enchiladas for 250NT. For an extra 85NT you can make it a meal and add three sides, which Steph decided to do. There is a little clock next to the enchiladas on the menu to let customers know that this item takes a while. For an item that takes a while you’d expect it to be hot, unfortunately this was not. The plate arrived almost at room temperature. Cold food is never good, but it’s even worse when you have large globs of cheese that don’t melt because the food isn’t hot. This is what happened here. Steph did appreciate the tortilla chips, since apparently a lot of Mexican places serve dorritos for tortilla chips, but the other sides I think were whatever. 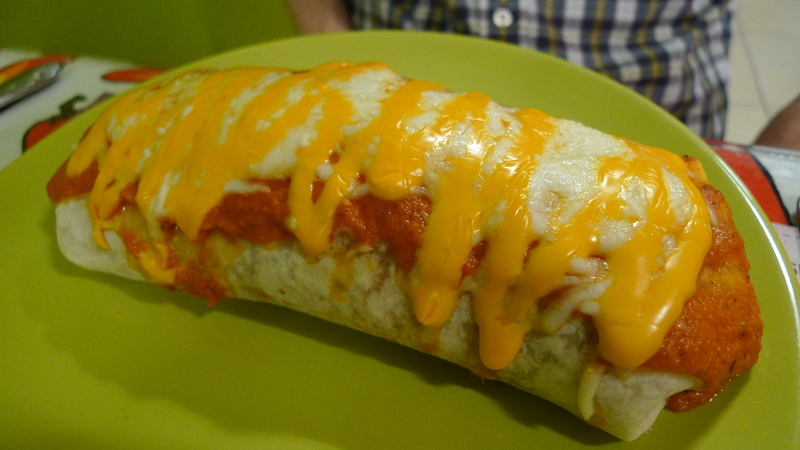 The enchilada sauce reminded us of pasta sauce, which while not bad is not what we were expecting for enchiladas. Also, the tortilla was kind of dense, and since it was cold, especially not great. Steph ended up just eating the insides. The meat, however, was pretty good. The large awkward globs of unmelted shredded cheese was not. So this picture is old; it’s from my last visit to Eddy’s because I didn’t take a picture this time. This picture kind of lies because my fish tacos this time did not look as good, nor did they taste as good. This time around the tortilla was bigger and they skimped on the insides. Biggest problem, again, was that my food was not hot. The tortilla, which was already way too big for the amount of fish and toppings they gave, was cold and dense. The fish was okay, a little dry, but seasoned well; however, the ratio of fish to tortilla was just off and threw off the whole meal. The one thing that was consistent was the salsa. The red salsa on the left was spicy and maybe could have used more salt or acid or something, but still was good. The salsa verde was pretty tasty. I think that both were homemade, but I’m not sure. Either way, the addition of the salsa to our meals helped a little. 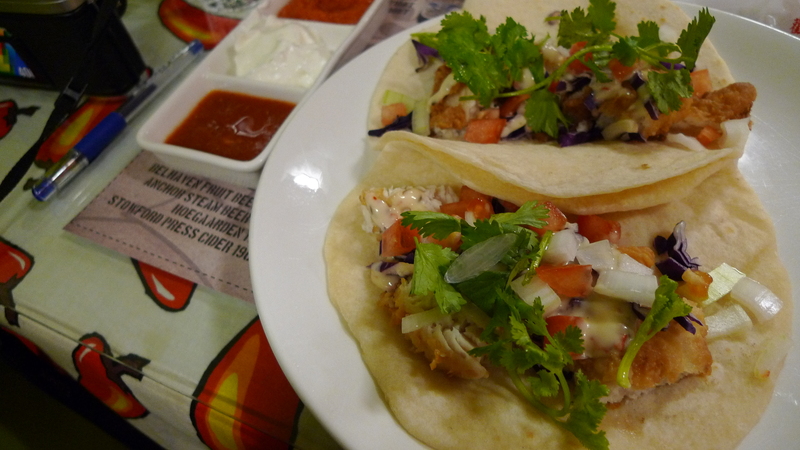 Read my updated review for Eddy’s Cantina. For most my life I hated Mexican food, but within the last year, I found a love for it (of course right before I moved to Taiwan). I had heard of Eddy’s Cantina from Hungry Girl’s blog and have been wanting to try it since according to her it is the best Mexican in Taipei. 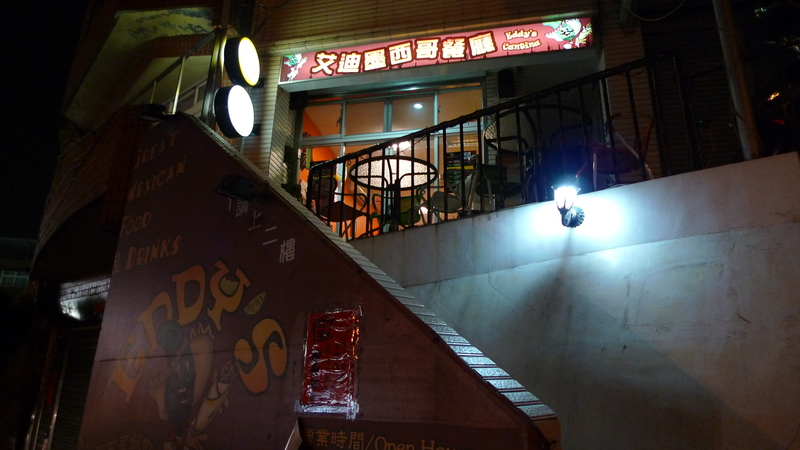 Eddy’s Cantina is located in Danshui (淡水) about a 10 minute walk from the Danshui MRT station. Walking into Eddy’s is like walking into any Mexican place in San Diego. Brightly colored walls, mariachi music in the background, and the smell of yummy food in the air. Eddy’s probably seats a max of 30 customers, and they do take reservations, so make them if you can, just to be on the safe side. 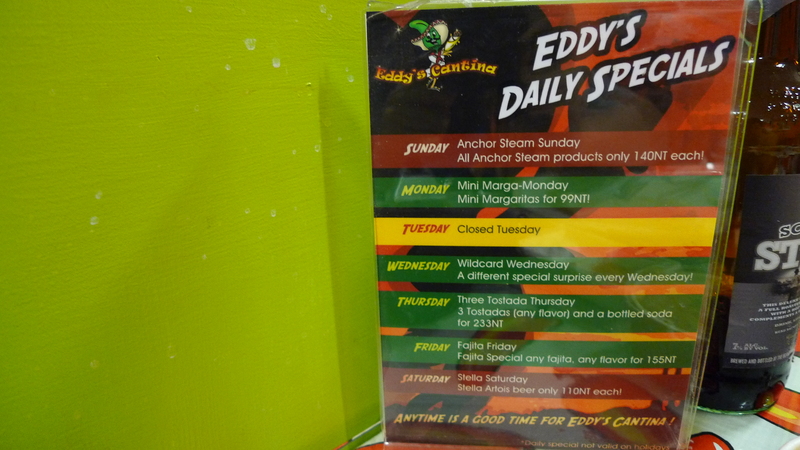 Eddy’s menu has lots of different options, even an entire section for vegetarians. 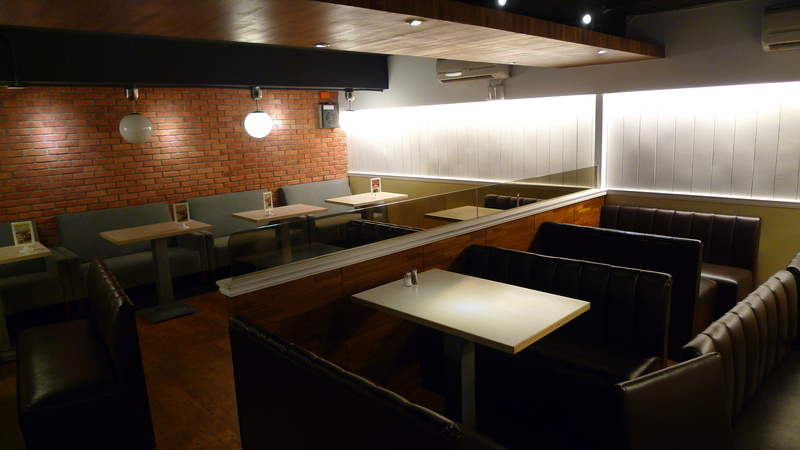 They have appetizers and main courses, which for 85NT more you can add 3 sides and a soda. 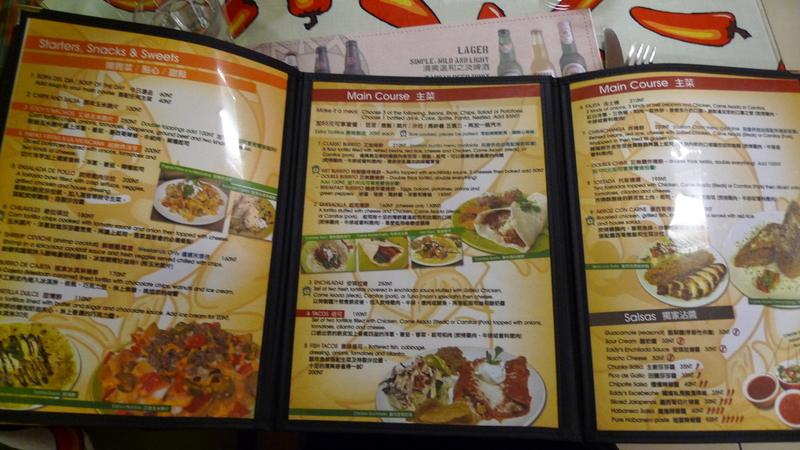 The menu is in English and Chinese with pictures to help those who like visual aids. 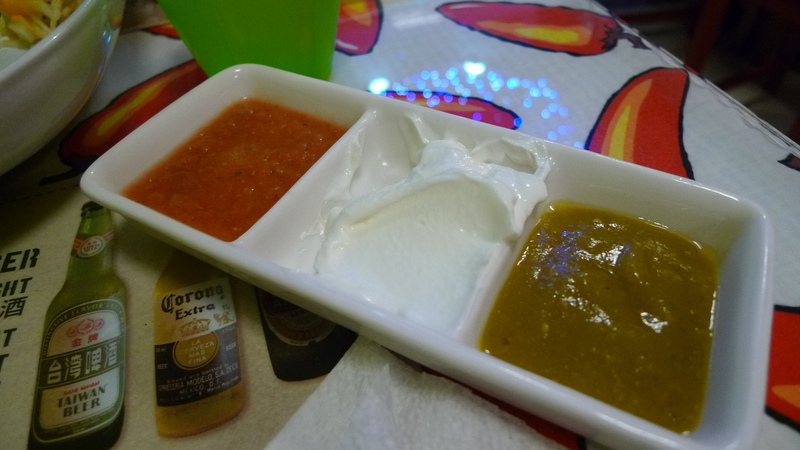 Right after ordering the waitress, who spoke English and was very nice, brought out dishes of homemade salsa: from left to right, homemade chipotle salsa, sour cream, and habanero salsa and on the top, pico de gallo. All of the salsas were delicious, I particularly loved the habanero salsa which was not tongue numbingly spicy, but spicy enough to be spicy. All the salsas were fresh and a perfect addition to all the dishes we got. 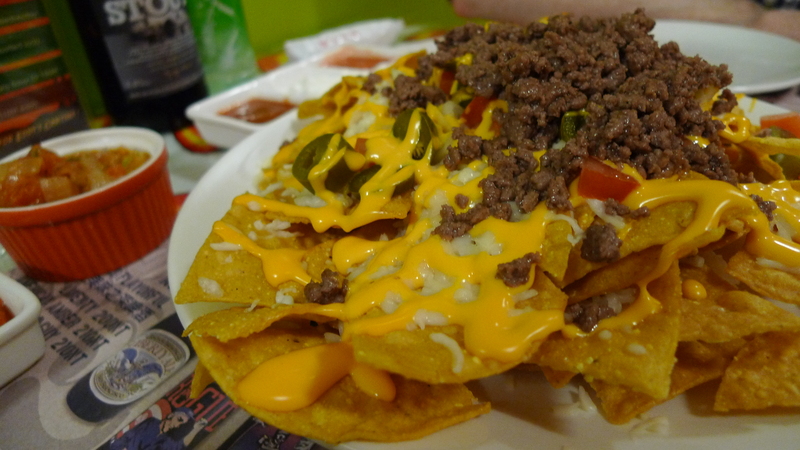 We decided to order Eddy’s Nachos (250NT) under the appetizer section. The portion size is pretty big, definitely something to be shared. The nachos had two kinds of cheese, jalepenos, tomatoes, onions, and ground beef. I do wish the cheese was melted better, but other then that, the nachos were great. The meat was well seasoned, and the combination of all of the ingredients was great. I miss $1 fish tacos from Rubio’s so I ordered fish tacos. 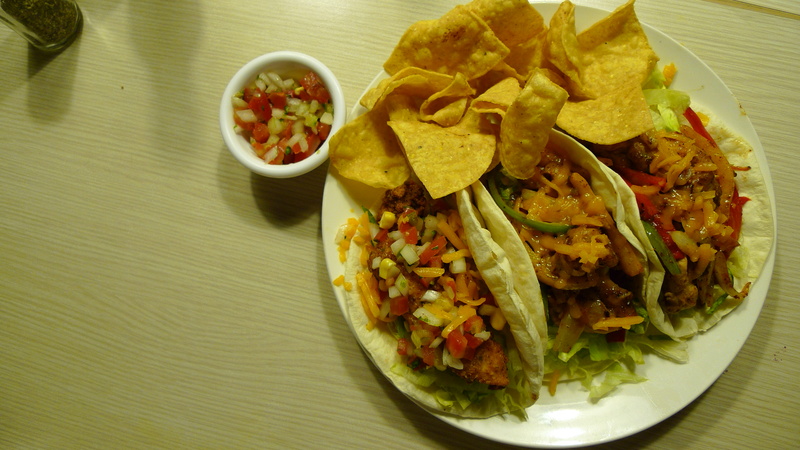 For 200NT you get two fish tacos of a decent size. 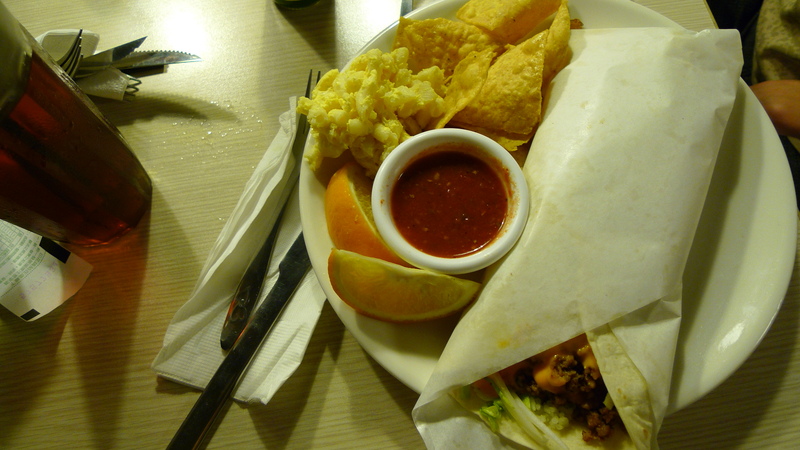 The tortillas, according to the menu, are made to order and tasty, although a little thick. Inside the taco was battered fish, cilantro, cabbage, onions, tomatoes, and some sauce. The fish was tender, and not oily which is always a big plus, and I could taste a hint of lime, although I wish there was fresh lime for me to squeeze. Without adding salsa the taco is a little dry, but I fixed that by adding a lot of tasty habanero salsa. Overall, pretty good, definitely satisfied my craving for fish tacos. My boyfriend opted for a carnitas wet burrito (260NT). Upon first glance it probably could have been more saucy, but we did have other salsas to add to it. When he cut into it he was disappointed about how much rice was in it, so next time we know to ask for less rice, but was really happy with how amazing the carnitas were. Being from San Diego, California there is definitely not a shortage of amazing Mexican food, that being said, the carnitas at Eddy’s were better than some of the carnitas we’ve had back at home. Super tender and seasoned really well, the carnitas made up for the fact that there was a little too much rice in the burrito. Next time, we want to try the carnitas tacos. Drink wise my boyfriend went with a beer, Belhaven’s Scottish Stout 500ml (220NT), on the recommendation of the waitress. It wasn’t bad, not great, but he liked it so that’s really all that matters. I opted for some horchata (80NT a glass or 300NT for a pitcher), which was really good, not too sweet, thick or watery. We also noticed on the table that there was a list of daily specials. We weren’t interested in the Friday special which were fajitas, but the Saturday special 110NT Stella’s sounds appealing. Basically, Eddy’s is probably the best Mexican food you’re going to get in Taipei and honestly, it’s better than some of the stuff you get back home. Service is great and it seemed like all the waitresses speak English. 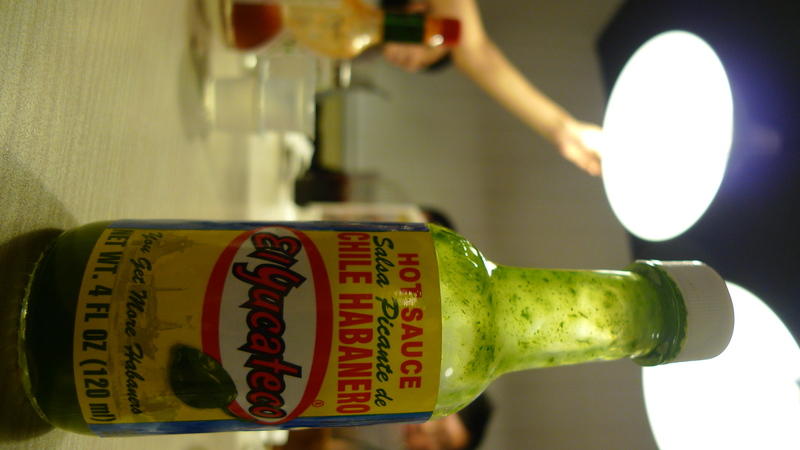 Sure it might be more expensive, but at least there is some Mexican food in Taipei that can help those who are homesick for it. I know I’ll be back!